My family and the Christian community were onto something. This simple practise meant that I was always conscious of how lucky I was that I have many things to give thanks for; Right there in front of me. It is important to live in an active world of gratitude. The clever bit was the continuity. We did it repeatedly, we did it every meal, we did it sleep walking; we did it till it was an unconscious response. It became a habit. We gave thanks without thinking about it. This in many ways is where we want to get. To have gratitude as our default, but how do we get there? We get there by being conscious in our ritual of giving thanks. We practise. 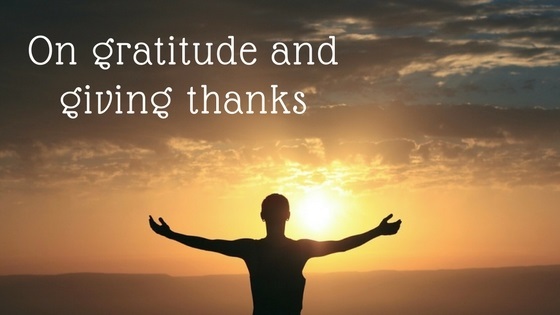 Adopting an attitude of gratitude also means there is a couple of words that get used repeatedly. Yup, those magic words: “Thank you.” Do you remember when your mom and dad used to say that… when we would ask for something, they would say “What’s the magic word?” The word Please was a default and of course – the words Thank you. Living a life full of thanks is living a fulfilled life. Again – it is an easy practise with profound repercussions. If you have so much to give thanks for, maybe you are living a wonderful life. You just have to wake up to it. That is all that we seek to recognize.